We were soooooo excited and thrilled with the amazing projects that were submitted for the last AEI♥U Challenge!! You all ROCKED that gold challenge!! It’s time to announce the winner of the free stamp set, so let’s get to it, shall we? Are these not amazing projects?!! Oh my goodness!! Thank you all so much for playing with us!! 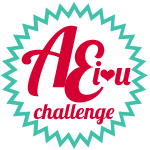 Please drop by again tomorrow for the next AEI♥U Challenge! I have no doubt you’ll love it as much as we do!! Oh my goodness!!! Thank you so much for choosing my cards. Totally made my day!